This was a 40 year old lady evaluated for a palpable neck mass on the right side. Ultrasound revealed he following . 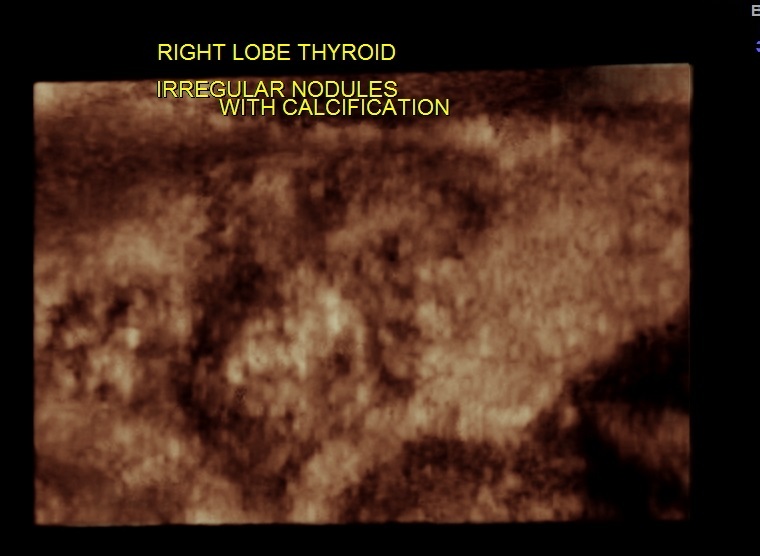 The right lobe of the thyroid revealed an irregular mass , with indistinct margins , punctate calcification and vascularity within and around the nodule. 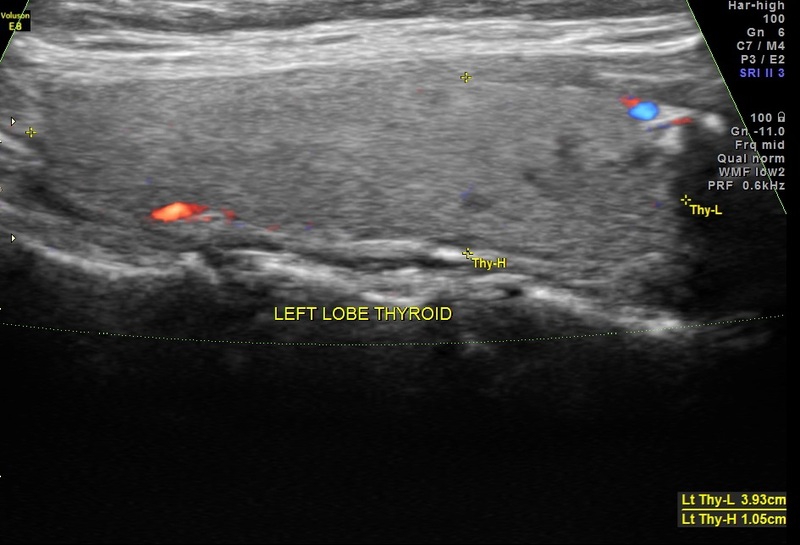 The left lobe of the thyroid and the isthmus appeared normal. 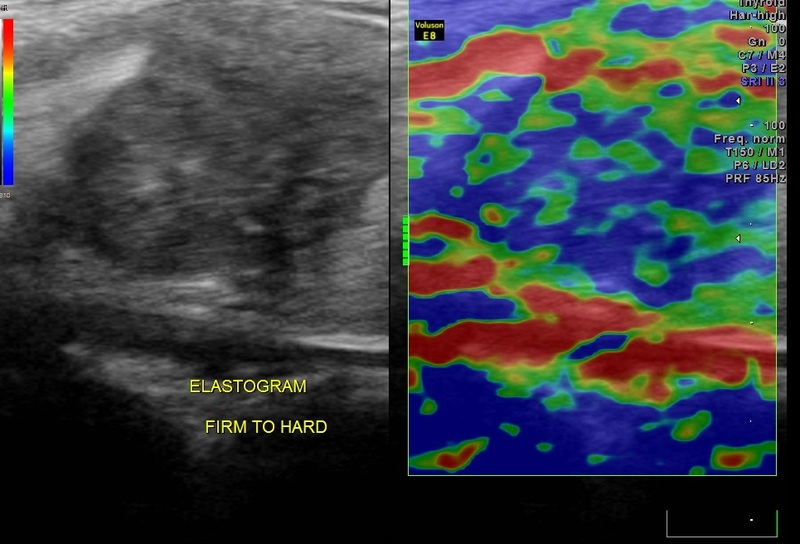 ELASTOGRAM of the mass revealed the consistency of the mass to be predominantly hard with some firm areas. 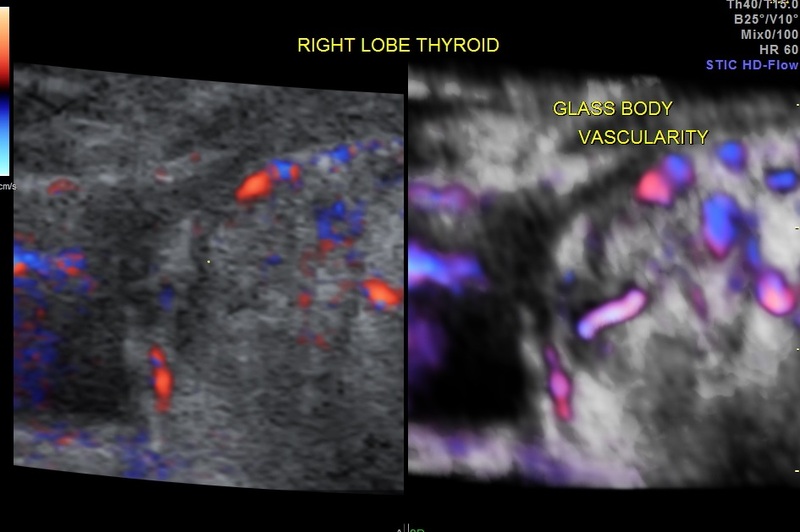 The 3 D glass body reconstruction clearly shows vascularity within and surrounding the mass. The 3 D reconstruction images very clearly show the indistinct and irregular margins and the punctate calcification. 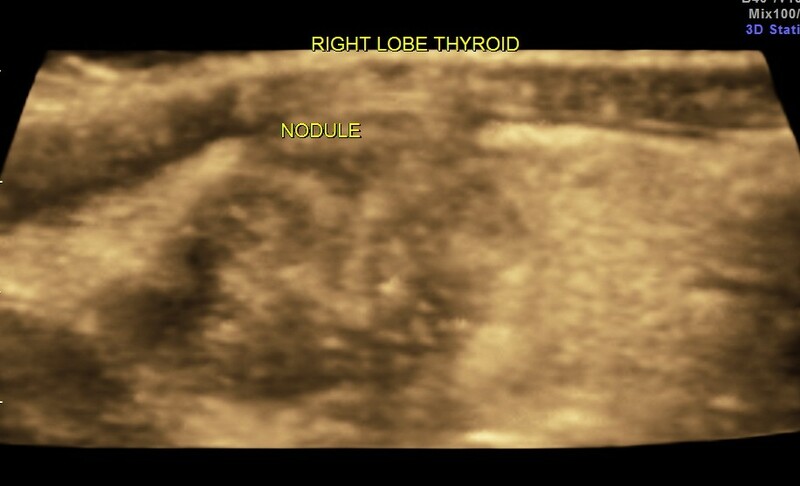 The neck scan revealed small nodes in the right side of the neck. 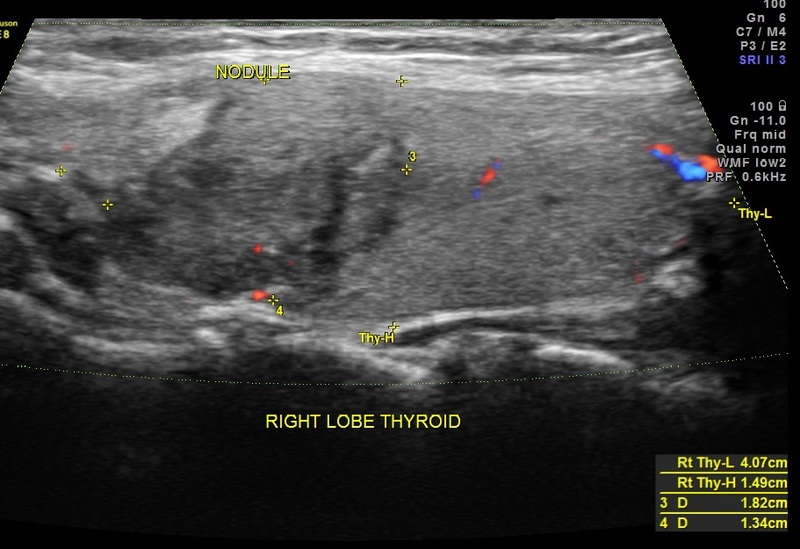 The features of a thyroid mass with irregular margins, punctate calcification and vascularity within and surrounding the mass is suggestive of PAPILLARY CARCINOMA OF THE THYROID. FNAC was done and confirmed the diagnosis of PAPILLARY CARCINOMA OF THE THYROID. The following is a sum up of a few internet searches . Please visit the following sites for more information. 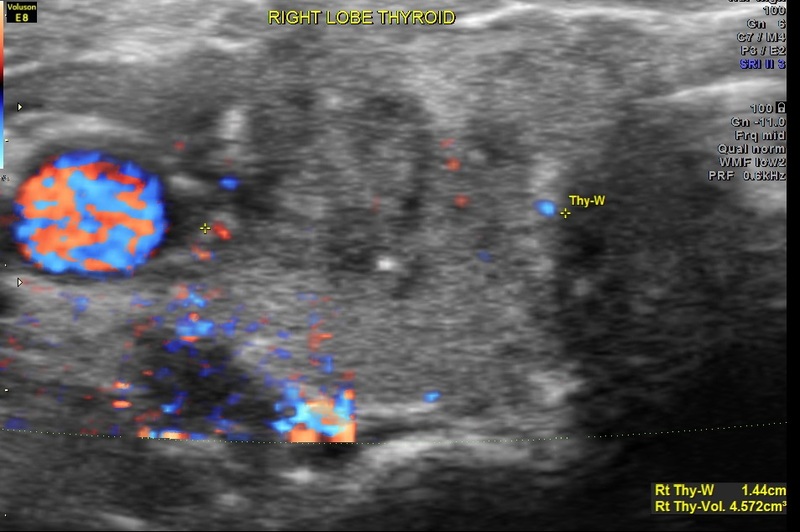 Papillary carcinoma accounts for 60%–70% of all thyroid malignancies , with a peak incidence in the third and fourth decades. Females are more commonly affected than males. 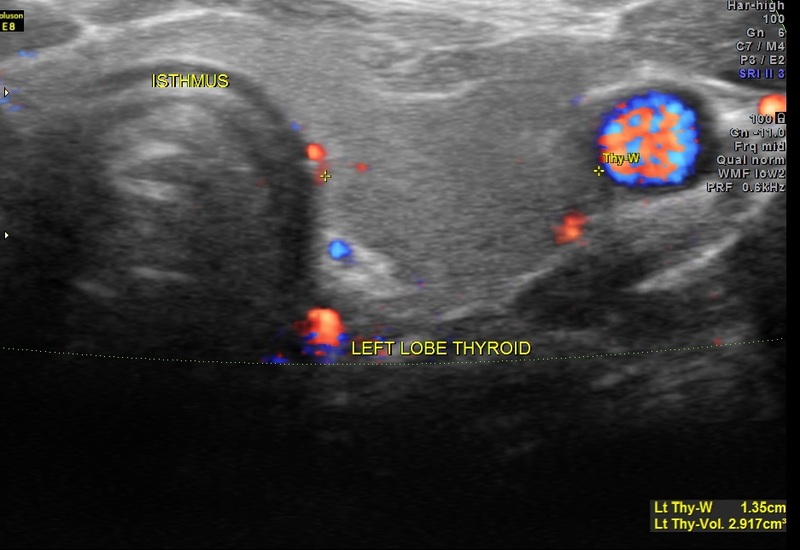 The tumour commonly spreads along the rich lymphatic system within and adjacent to the thyroid gland accounting for the multifocal nature of the tumour within the thyroid gland and its spread to regional lymph nodes. Venous invasion occurs in 7% of papillary carcinomas and distant metastases to bone and lung are seen in 5%–7% . The treatment is thyroidectomy followed by radioiodine and thyroxine.